As much as I love Shopbop, their stuff can get pretty expensive. Especially when you're on a college girl's budget! So when they have a sale I always like to take advantage and stock up on some amazing stuff for the spring and summer. Make sure to use the code "GOBIG17" which applies for both full-price and sale items so you can get 15% off orders of $200+, 20% off orders of $500+, and if you really feeling like spending some money on a new wardrobe then 25% off orders of 800+. I linked some of my favorite stuff from the sale that you can shop below. Last year I bought this gorgeous white lace up dress which I can't wait to wear again! White is my weakness and that's probably why I'm eyeing so many white pieces from the sale this year as well haha such as that ruffled-bow top! 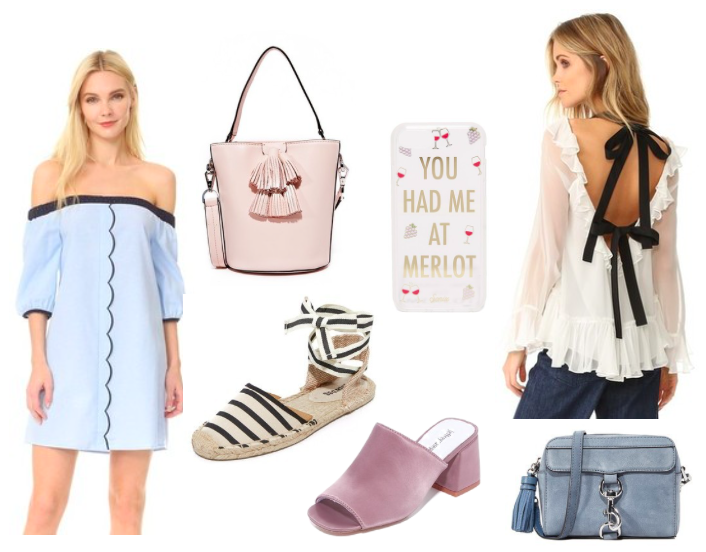 And that scallop off the shoulder dress is everything and only $54! As for shoes, I loved the Soludos wedges that I bought last summer and thinking of getting these striped ones (under $60!) or these pink satin mules which totally reminds me of the 90's. Lastly, this is the perfect time to stock up on designer bags and Rebecca Minkoff has some gorgeous ones such as that pink bucket bag or the camera bag which is perfect for spring break. And how can I not include that fun phone case? I recently just got an iPhone 7 and I can't find good phone cases for it anywhere!